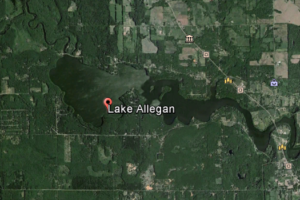 Lake Allegan is a man-made lake located in Valley Township just outside the city of Allegan. The lake has a large surface area of almost 1,600 acres. Lake Allegan is adjacent to the 50,000-acre Allegan Forest. Geese, ducks, kingfishers, eagles and great blue herons frequent the lake. The Allegan Lake Overlook is one of the best places to view the lake located on Monroe Road, two and one half miles from M-89. There is a DNR access point and a boat launch located at Echo Point on Monroe Road near 42nd Street.